1. GoGo Squeez Fast Fruit — When I first saw these, I openly judged the idea of marketing and packaging these products for the adult set, because I've been so used to buying fruit and veggie pouches for my daughter. It just seemed silly for an adult to eat something so similar. But I'll be the first to admit I've stolen a bite or two (or thirty) of my daughter's applesauce pouches over the years. They're actually a quite satisfying, portable little snack—especially when you're sure to get something that is 100% fruit. I was able to get a few boxes of these for just over $1 each at Vons this month, after sales and coupons (regularly priced just over $4/each, which is way too high, in my opinion!). The apple-raspberry-cranberry flavor is absolutely delicious, and although I'm not planning on getting all my fruits and vegetables in pouch form, this is an easy thing to tuck in my purse for on-the-go. As long as I can get them for a decent price, I'll totally buy them again! 3. How Great You Are by Antioch Live — When I find a song that absolutely makes my soul soar, I've been known to listen to it on repeat for a solid 30 minutes. And that has happened over and over again with this incredibly beautiful song. It makes me all goosebumpy every single time. 4. Read-Aloud Revival podcast — Reading aloud to Eisley is something I've been passionate about since she was just a baby, mostly because some of my favorite memories are of being curled up on the couch with my sisters while my mom read to us before bed. This podcast is definitely one that I'm benefiting from now and will continue to benefit from as Eisley gets older! It makes me all excited about all the books from my own childhood that I will get to introduce her to as the years go on…the Little House series, Harriet the Spy, anything by Beverly Cleary, Matilda, Where the Sidewalk Ends, Charlotte's Web. I love that this podcast encourages parents to read aloud for just 5 minutes a day. Totally doable, right? It's amazing how it adds up! 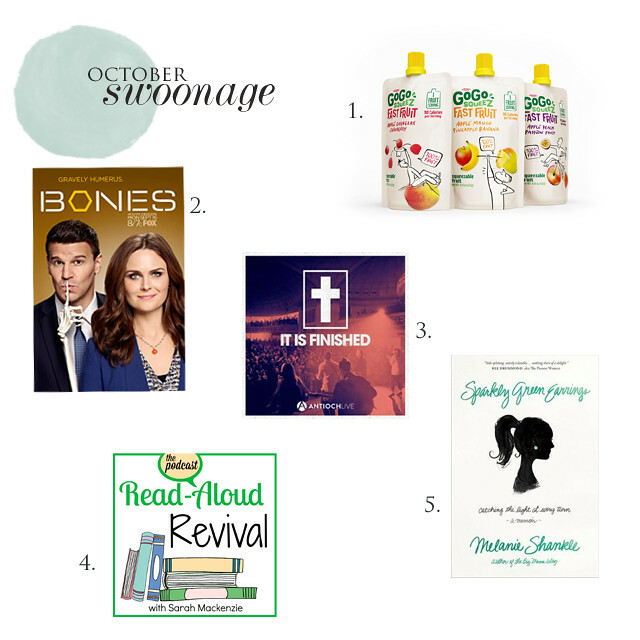 What had you swooning this past month? I'd love for you to share! — Further reading: What made me swoon last month and last year. I just put out a call on social media asking for memoir recs. Gonna add this one to my list & maybe bump it up a few notches based on your recommendation! I have so many memoirs to recommend, you have no idea! For some reason, they've been my favorite genre for the past several years. I may end up doing a post on my favorites soon, because there are so many I've read and loved and think everyone should read. :) You'll have to keep me posted on any great ones you come across!